We interrupt our two part blog entry for this special good wishes bulletin. The US college search season for the Class of 2013 is coming to a close. Although many colleges and universities have been telling their applicants their admission decisions for about a week or two now, the big guns (the Ivies, Stanford, etc.) released their yeses and nos at 5 am this morning, March 29, 2013, Manila time. To those who applied, good luck. And follow my advice about looking for the good fit. As a former high school teacher, I'm often asked by students: what is the best college out there? Is Ateneo better than La Salle? Kids always hear: it depends on what you're studying...if business, then Ateneo, if engineering, maybe La Salle. It goes on and on. Very often, when parents and students are interested in college in the States, they ask what is the best college in the States? They turn to publications like US News and World Report's America's Best Colleges for the answer. I have serious problems with this publication but that's an issue for another day and another blog post. My answer to the question what is the best college (in the Philippines, in the States, and in the world) is this: you're asking the wrong question. For me, the important question is not what is the best college out there but what is the best college out there FOR YOU. For many families, the search for an American college boils down to what is the most prestigious college I can get into? And it normally boils down to the usual suspects, the usual names: Harvard, Yale, Princeton (what someone I know calls "The Holy Trinity of American higher education"), the rest of the Ivy League and their clones like Stanford, UC Berkeley and for the technically bent: MIT and Caltech. While there is nothing wrong these fine schools, to base your search on where you will be spending what is arguably the most crucial four years of one's education on a university's name and perceived prestige is at best misleading and at worst, downright destructive. If you buy a suit, the most important thing is that it has to fit. I don't care what fancy designer or label is attached to it, how much it is, or what the material is...if it don't fit right, you'll look silly wearing it, if you wear it at all. If the suit fits right, it feels great, you look great and you feel like a million bucks. So it is with colleges. If you go to a college that FITS you, you'll learn more, you'll flourish, you'll get better jobs, and you find yourself looking back on your college years fondly after you've graduated and living the legacy of your alma mater (which literally means "nourishing mother"). Strive to find this fit in your college search and no matter how the race turns out in the end, you'll be the winner. Hello world indeed! My name is John Sy and this blog is all about applying to and attending US colleges and universities. It is written specifically for students from the Philippines who want to do their undergraduate (bachelor's degree) work there. While it is not directed specifically to graduate students (master's and PhD), some similarities may come up and I'll be sure to point them out when that happens. Right now, I am working towards a professional US College Counseling certificate from UCLA Extension (www.uclaextension.edu). It's an online course of study that consists of six required classes and an internship. I've already finished three classes, I'm enrolled for two more for the spring term. I hope to start the internship and the final capstone course in the fall. Besides being an upcoming counseling professional, I'm also a former international student...twice! In 1983, I went to Santa Clara University in California to get my bachelor's degree in physics (which I earned in 1987). 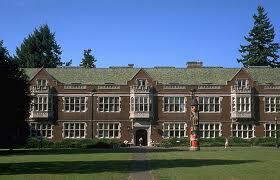 I returned to the United States in 1990 and got my master's degree in physics from Washington State University in 1992. I've been a teacher most of my professional life (even during an 8 year stretch doing IT consulting in New Jersey I was still teaching). I am also the proud father of two boys, of whom the elder, Tyler, is just days away from finishing his college search process and will soon choose where he will be spending his college years. So I come at this from various perspectives: student, parent, teacher, and professional. I hope I can share with you, through this blog, my various adventures in and opinions about the labyrinthine process that is US college admissions. And yes, my sarcastic and sardonic (and occasionally R rated) sense of humor will be featured as well.